The fun thing about my job is that, on a certain level, I get to be a college student forever. Not in the I-have-no-real-responsibilities-and-can-live-on-ramen-noodles-and-beer way, but in the I’m-always-learning-something-new way. The money books in higher ed are for the big survey courses: Intro Psych, Intro Sociology, Intro Human Communication… anything with a 101 after it. That’s where the developmental dollars go, so that’s where I go. So, for the past twenty-odd years, I’ve essentially been taking one introductory class after another. Sometimes I repeat courses. I am a perpetual freshman. So right now, I’m working on an intro economics book. I’ve done some solid time on most of the other social sciences, but never felt confident to dip my toe into the “dismal science.” I’d avoided it in college, for fear of The Math, and as an adult I’ve regretted not having any knowledge of the discipline beyond what I leaned from reading Freakonomics. It’s a baptismal by fire, to be sure, but it’s a great gig with talented authors. And I get to learn the discipline while getting paid to do what I know how to do, so you know, win-win. Today’s lesson: Opportunity Cost. That’s what economists call the costs associated with not doing something. So going to college, for example, has a cost–the price of tuition, the price of books, etc–that’s easy to tally. But there’s also the opportunity costs associated with going to college: you give up four years of gainful employment. Of course, not going to college has opportunity costs of its own, including a huge long-term return on the investment. So, what does this mean for an hourly worker who sets her own hours and has to do a fair share of the household management? As a narrowback, I feel tremendous guilt when I hire someone to do something I could do myself. The thought giving someone else money to, say, paint the bedroom, makes me feel so lazy, inept, and indulgent, like some modern day, low-end Lady Mary who doesn’t know how to do anything by herself. 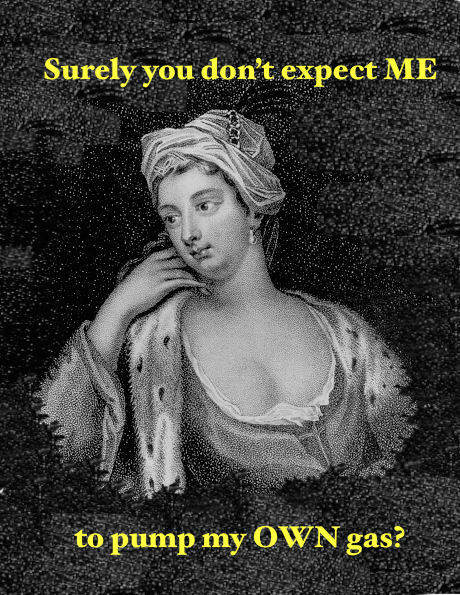 Because Downton Abbey images are in copyright, here is Lady Mary Wortley Montagu, poet and aristocrat and in the public domain, expressing her concerns. When I told my mother I had hired a guy to mow the lawn, you’d have think I’d done something completely decadent and fiscally irresponsible, like leasing a luxury car or booking a vacation before the mortgage was paid. But per The Economics, it was a wise decision, because of the opportunity costs associated with not hiring The Guy. It would take me at least an hour to drag out a lawn mower, mow the lawn, then put the mower away, and then to sweep up all the clippings, dust, clippings, and annoying helicopters that drop off the swamp maple out back. Then I’d have to take a shower to wash off all that dust lest I risk an allergy attack that would take me out of commission for the rest of the day (at least). By outsourcing the job–which incidentally takes my man Oscar and his crew about 20 minutes per week–I’d saved roughly two hours of labor and transition time, which I could spend instead working at my hourly rate. Put simply, the cost of hiring Oscar winds up being less than the cost of not hiring Oscar. Economics wins! « Who doesn’t want to go to Irishtown?